The D7500 is the new mid-range DSLR from Nikon. It replaces the D7200 and offers some great upgrades from that model, as well as many borrowed elements from some of their other cameras – including the well-loved flagship D500. Some of the new features include that 4K video capability, metering that matches the D500, and a tilting touchscreen. Enhanced sealing and a better grip round out the changes to the body and are welcome additions that make the D7500 feel like an upgrade. The things it loses are worth noting, however. First, the loss of 3MP of resolution might seem troublesome, but it doesn’t matter because it doesn’t detract from the quality and it provides better speed. What is bothersome is the second memory card slot, as well as the elimination of the Ai indexing tab that allowed the older model to be compatible with some older manual focus lenses. 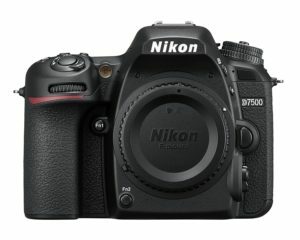 The sensor is paired with Nikon’s EXPEED 5 image processor, and Nikon made the smart decision to omit the low-pass filter. The D7500 features an ISO range of 100-51,200, with an unbelievable expanded range of 50-640,000. The D7500 is just slightly lighter than the D7200, but the feel of the body is about the same. It still feels comfortable and stays that way for longer shoots. The optical viewfinder is bright and crisp, and it gives you a full view of the scene. The built in Wi-Fi and Bluetooth features signal Nikon’s continued push to connect with the SnapBridge technology. However, as we’ve said with some past models that utilize SnapBridge, it’s still a bit buggy and unpredictable. The Nikon D7500 is priced well for a thought out enthusiast/mid-range DSLR. It has exceptional speed, great low light performance, and competitive video features. It has some real improvements over the D7200 and older D7* models, and it would be a great upgrade model for a photographer looking to make the jump up from entry-level. It has some important specs borrowed from the flagship D500 and will make an excellent addition to your camera bag.